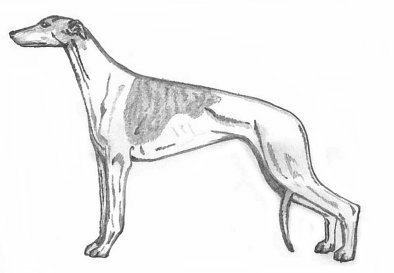 Greyhounds are gentle and good natured and unlike other purebred dog they do not carry genetic disorders. Despite this they are misunderstood by many people and over looked in rescue shelters again and again. A common misconception is that they require vast amounts of exercise, this is nonsence, infact a dog with access to a garden will be quite happy with two 20-30 minute walks a day. 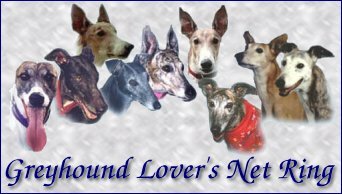 They are not for everyone, but if you are thinking of taking on a rescue dog take the time to read some of the information on this site and consider a greyhound. A vast number of Greyhounds in rescue centres today are cast offs from the racing industry. They are instantly recognisable as they have registration tattoos in their ears. The transition from racing dog to family pet isn't always an easy one. Who you adopt your greyhound from will determine how well socialised they will be. Remember, an ex-racing greyhound will not be used to a home environment, you will have to help them adjust. They will have to be socialised with other dogs and taken to dog training classes. Once your dog has settled in you should find him or her to be a part of the family. Greyhounds are not overly demanding dogs, they will be quite happy to sleep while you watch the televison, infact they are notorious couch-potatoes and are often to be found taking up the whole sofa! All Greyhound are proud to have virtually adopted 4 year old Bud. He was rescued as an ex-racing dog from being put to sleep. It is probably a good idea to talk to other people who are interested in taking on a rescue greyhound or other people who have already taken the plunge. This email list is a great way to do that. is owned by All Greyhound. This Site Hounds Webring site owned by Jenny. Disclaimer: This website is not affiliated with any of the organisations featured on this website. If you would like to contact me please feel free to click here and do so.